Welcome back to Toy Aisle, io9's regular round up of all the future drains on our wallets we’ve seen on the internet lately. 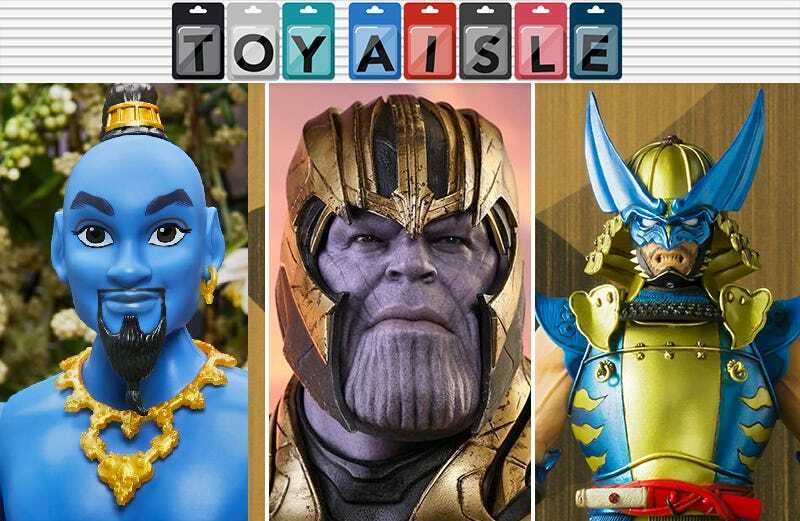 This week, Avengers: Endgame comes to Hot Toys, Wolverine gets a truly ridiculous samurai re-imagining, and you can be on Detective Pikachu’s case with a truly adorable hat. Check it out! It was first shown off at Toy Fair in New York in February, but we now have official pics for the latest addition to Tamashii Nations’ Manga Realization line with Outlaw Wolverine now decked out in full feudal armor. The shiny blue and gold finish looks fantastic, as does this 7-inch Logan’s masked exaggerated rage face. We’re not entirely sure where either version of those oversized claws retract to when not in use, but who would ever want to put them away? Pre-orders start next week for $85, while the figure is expected to ship sometime in August later this year. If the many, many action-figure versions of Iron Man are too static for your tastes, Ubtech will happily sell you a 13-inch walking, talking, animated version of Stark that can do everything from autonomously guarding a room to draining $290 from your bank account. It’s somehow still cheaper than most of Hot Toys’ Iron Man creations, and it works with a free accompanying app for playing augmented reality games. The visor even pops-up to reveal Tony Stark’s face, but since the effect is created with a small LCD screen, you can swap in your own face and live out at least part of your Avengers fantasies. Looking for a new hanging lamp to repeatedly bang your head on throughout the day? Designer Kenneth Cobonpue has an entire line of Star Wars-themed home furnishings, including TIE fighter arm chairs and Wookiee foot rests. But the most striking piece is this chaotic hanging lamp featuring a cluster of Jedis with glowing lightsabers in hand ready to fend off a single Sith attacker. It’s a form-over-function piece, as it doesn’t look like the lamp will cast too much light on a space—but nothing is impossible with the Force. What makes your common electric mouse Pokémon an extraordinary detective? A fetching deerstalker, of course! But while you may not be an electric mouse Pokémon yourself, you can now at least pretend you are one with this glorious combination hat/Pikachu ears get-up, coming as part of the official Pokémon Center’s line of apparel and merchandise for the Detective Pikachu movie. Sure, you can get a t-shirt with a neon sign replica of Noctowl on it. But why would you want that when $25 can turn you into the greatest solver of Pokécrime on the planet? The Deerstalker is set to hit the Pokémon Center webstore in the near future, but for now, you can browse what’s already available here. Also, we can attest: You can and will look delightfully ridiculous wearing this. What do you do when a part on your Corellian freighter breaks and you don’t have access to a Wookiee to fix it? You turn to this roll of “Corellian Engineering Multi-Purpose Bonding Strips” and hope your temporary repairs survive your next jump to hyperspace. Available exclusively at Star Wars Celebration in Chicago next week (and hopefully at other space stations and outposts afterwards), this $15 roll of duct tape features technical illustrations so it looks suitable for a space ship, even if you’re only using it to hang toy lightsabers on your wall.